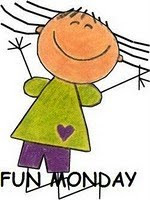 So glad to be back to Fun Monday before ending the year! Just take a picture of one Christmas ornament which you love the most, explain why, and if you don't have any explanations it's also OK. For those who haven't celebrated Christmas, just take a picture of something else you love as decoration. First off, here is my Christmas tree! 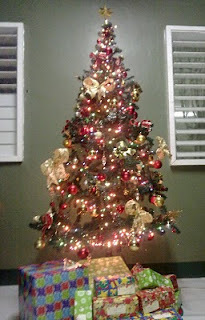 This year I did not so many decors like I used to but I decided to bring the tree out the porch. This is a favorite decor as there was no Christmas without it. So here it is with its lights. I love them in evening...it feels nice listening to the lights sing those Christmas carols. And my most favorite Christmas decor of all is the Nativity! And most especially this one as this was given by a friend 12 years ago. One of my most treasured decor. For 12 years I have kept it and I intend to keep it forever. 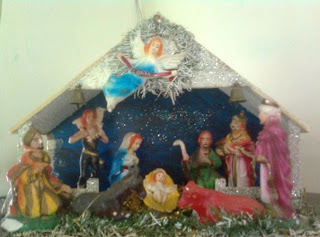 By the way, here in my place we this Belen. We always display the Nativity in our living room every Christmas. It's not so big we can put it on top of a table, a low shelves, etc. So that's it. Let me go and visit the others now and see what they have. I hope you all had a Merry Christmas and a wonderful 2010! Oh, and I'll add you to my FUN MONDAY list on my page. Once you volunteer, you're pretty much it! not much celebrations of these in this part of the world:(.. The nativity is real cute! We have a very big one Mr.G. got when he was 2 years old, in Italy there were no Christmas trees but very big nativity scenes ! If we would put the whole village together with farmers cows, houses etc, it would take half of the room, so we used to squeeze it under "my" German Christmas tree, lol ! Nobody volonteered so I will announce your devotion, lol ! we have a little nativity scene that my husband bought when he was just a young teen... so it's probably 50 years old. We display it, too! Hi Mariposa! Glad to see you back with Fun Monday and thanks for volunteering to get the new year off. 2010 is going to be exciting for you, I'm sure. My Nativity is a multi-colored pottery one that my friend made for me about 40 years ago--very precious. Like you, well-wrapped Christmas gifts are the best decoration for the tree. Your tree is quite festive and how fortunate to live where the weather is mild so you can enjoy it outside. I also display a nativity at Christmas...my SIL made it for me 35 years ago. Wrapped presents under the tree makes it look so festive. Happy New Year to you and yours Mariposa. do you have a topic for fun monday?